A major route along the Ohio side of the Ohio River was closed Friday after a house-sized boulder fell on the westbound lanes. 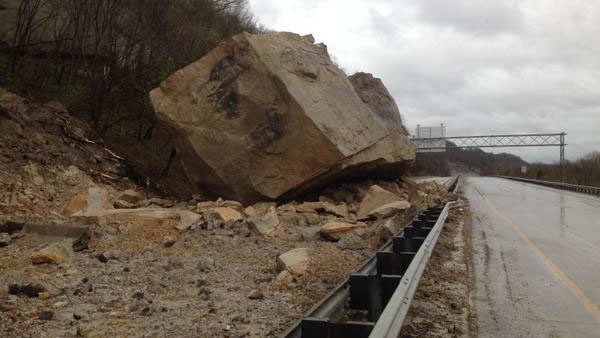 IRONTON, Ohio —A major route along the Ohio side of the Ohio River was closed Friday after a house-sized boulder fell on the westbound lanes. The rockslide happened at about 3 a.m. on U.S. 52 just across the river from Ashland, Ky., allowing crews to detour Ohio traffic through Kentucky. WSAZ-TV reported that a pickup ran into the rock shortly after it fell, but the driver was not injured. Crews estimate it will take two days to remove the boulder and other debris. Whether it is dealing with organic peat soils in the northern part of the state of Indiana, coal mines and sinkholes (karst) in the southwestern part of the state, or the landslide prone areas of the southeastern region, whatever challenging and complex geologic environment that a project offers, our staff, through their many years of experience, has the expertise to handle the geohazards and challenges presented by Indiana’s variable geology and Indianapolis metropolitan area.